You’re all receiving this monthly announcement a little earlier than usual because I’ll be off to vacation tomorrow!! I’m going to Las Vegas for an entire week. Exciting? Well… believe or not, I DO NOT gamble, so I’m not sure what I would be doing the entire week. So, how about gambling in Japan? Gambling in Japan is generally banned by the Criminal Code; however, there are several exceptions, including betting on horse racing (keiba), certain motor sports. Public sports and lottery (takarakuji) are held under special laws in order to increase the income of national and local governments as well as to offer a form of entertainment for many people. Pachinko is a pinball-like slot machine game, and it is officially not considered gambling because Japanese laws regard pachinko as an exception to the criminal code on gambling for historical, monetary, and cultural reasons. It appears there would be “Strip of Japan” casinos could rival Las Vegas by 2025. What do you think about that?? There was an article published in 2017 that reported a strip of full-scale resorts on Osaka’s Ymeshima Island in Japan could generate $10.9 billion a year in gaming revenue and rival Las Vegas. Osaka is diligently preparing for the 2025 World Expo. This related news, updates were released recently, and the Japantimes reported that there is a growing confidence the man-made island, Yumeshima island to be the one of Japan’s first casino resorts, and Kansai’s business leaders are stepping up efforts to win local approval and central government funding for major transportation infrastructure projects over the next two decades. Another fun fact about this Yumeshima island is that there is an underground network currently in progress, too. This project has begun in 2018 and is set for completion in 2024, will conclude in a futuristic social life infrastructure, comprising a 55-floor skyscraper that will reach about 250 meters in height, and will contain entertainment facilities, offices, retail spaces, and a hotel. 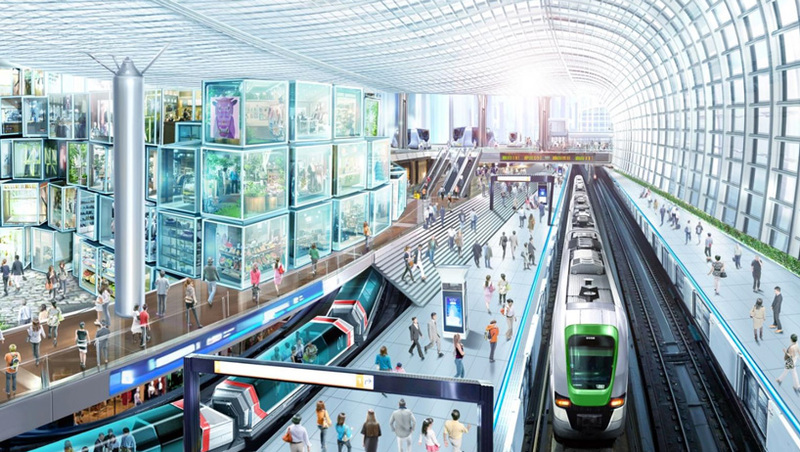 Additionally, the plan includes the renovation of 15 existing stations on the midosuji and chou lines, self-driving vehicles, underground streets, and new digital functions and services. Matcha ( 抹茶), Japanese Green Tea is the must have item for Tea Ceremony. The Tea Ceremony is a result of the Zen concept of greatness in the smallest incident of life. In 16thcentury in Japan, Tea Ceremony was indurated by Rikyu Sen (1522 – 1591) as the Wabi Cha style, which emphasizes nature and simplicity. 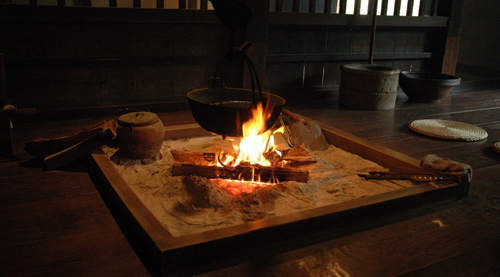 The Tea Ceremony is the appreciation of tea, art, natural beauty, and simplicity of the four seasons. Matcha is rich in natural elements and nutrients that are good for health. Matcha contains Catechin, also called Tannin, which is a bioflavonoid that has both antiviral and antioxidant qualities. It helps to prevent cancer by inhibiting the growth of cancer cells. Catechin also has many positive cholesterol-lowering effects. It helps to clear blocked veins and arteries, allowing your blood to flow more smoothly. Other beneficial effects of Catechin are: removing free radicals, reducing cholesterol, reducing fat, antibacterial and sterilizing effects, prevent infections, moderating allergies, oral care agent, and prevents dental cavities. Matcha helps relax the mind and allowing one to focus on the task at hand, so try a cup of green tea approx. 40 minutes before work or study. Matcha contains caffeine, yet it also contains Theanine, and Theanine tempers the effects of caffeine; therefor, Matcha does not cause nervousness or excitability because of Theanine contents. We certainly don’t have to hold a Tea Ceremony to enjoy Matcha. In general, Matcha is prepared in a Chawan (tea bowl) and use a bamboo Chasen (whisk) until it has a rich form on top; however, there is a bottle shaking method you can use for a casual preparation, so that you can enjoy drinking genuine Matcha anywhere, anytime, freely. 1. Put 1 teaspoon of Matcha into a pet plastic bottle or your preferred container with a capacity of approx. 17fl oz and a lid. 2. Pour 7 – 12fl oz of cool or room temperature water into the container. 3. Shake the bottle quickly and boldly 10 – 20 times. I hope you’d enjoy many benefits of Japanese Matcha, green tea at your home, and stay healthy, enjoy the long and happy life. 謹賀新年 / A Happy New Year!! 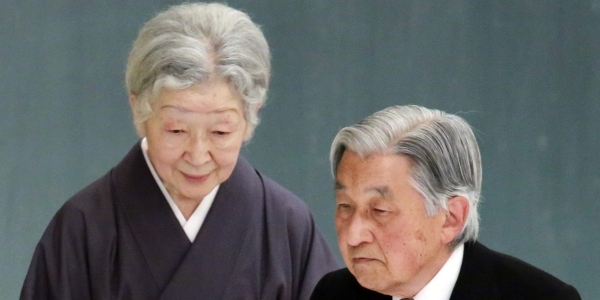 The New Year is undoubtedly the most anticipated and important holiday for the Japanese. It is a long celebration that runs December 31 to January 3. During this period, all sorts of ceremonies and customs are practiced. Shimekazari 注連飾りis one of the many fascinating and unique New Year traditions that are still being followed even in modern times in Japan. Immediately after Christmas all associated decorations, most of which are international such as Christmas tree, are removed and replaced by various traditional symbolic objects with deep auspicious meanings. Shimekazari consists of shimenawa (a sacred rice straw rope), pine, and a bitter orange as a symbol of posterity, combined with various other good luck charms and adornments such as a crane made of Mizuhiki cord. When hung above the entryway of a site, it marks the border to pure space to a shrine precinct or a ritual site. The term shimenawa is the combination of shime, or items used in ancient times to symbolize ownership, and nawa, or rope, which was the most common way to mark an object or space. 2019 is a very special year for Japan America Society of Iowa (JASI). 30 years ago, on January 29, 1989, the first meeting of JASI was held by eight members. The group was led by Ikebana master, Ms. Hiroko Sogi (1931 – 2012). The first members shared one of traditional Japanese art of Ikebana (Japanese flower arrangements) with the community of central Iowa. Please mark your calendar now for our celebration event day: Saturday, October 12th, 2019. Our 30th Anniversary Year theme is “Miyu, 深結 – Me and You, Celebrating 30 years of what ties us together” to enrich Japan-America relation. 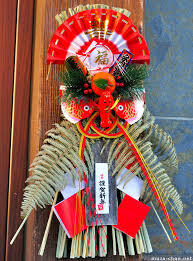 正月(shogatsu)、Shimekazari 注連飾り — New Year decoration to bring luck and ward off evil spirits. November is the month of Shichigosan (literally means 7-5-3); it is to celebrate the growth and good health of children ages 3, 5 and 7 through the Sinto ritual. It’s also to celebrate the Labor Thanksgiving Day (not to be confused with the same Thanksgiving here in the US), called kinrōkanshahi - 勤労感謝の日 , which takes place annually on November 23rd. With similar roots as Thanksgiving here in the US, it was once a fall harvest festival, and it has since changed in meaning over the years. Its history goes back to around 480 BC and celebrates the year’s hard work. The modern holiday was established after World War II in 1948, and became Labor Thanksgiving Day, the holiday celebrating workers in Japan. The day is about being thankful for workers who do their jobs well. Sometimes you literally thank those people, school kids make thank you cards and gifts for municipal workers like police, firefighters, and hospital workers. With Halloween right around the corner, I started wonder if Halloween is conducted in Japan. Well, the answer is “yes”. Within the past ten years, Japan has shown a gradual increase of interest in Halloween, and with that an increase in commercial hype. Japanese Halloween is very much focused on commercialism and costumes only. No “trick or treating”. Halloween is a celebration observed on October 31st, the eve of the Western Christian feast of All Hallows’ Day, the time in the liturgical year dedicated to remembering the dead, including saints (hallows), martyrs, and all the faithful departed. This sounds more like the “Obon” in Japan…. The dead, refers to Yūrei (幽霊) in Japan. It’s meaing “soul” or “spirit”. There are few other alternative names, and they are thought to be spirits kept from a peaceful afterlife. However, if the person dies in a sudden or violent manner such as murder or suicide, if the proper rites have not been performed, or if they are influenced by powerful emotions such as a desire for revenge, love, jealousy, hatred or sorrow, the reikon is thought to transform into a yūrei, which can then bridge the gap back to the physical world. The emotion or thought need not be particularly strong or driving, and even innocuous thoughts can cause a death to become disturbed. Once a thought enters the mind of a dying person, their Yūrei will come back to complete the action last thought of before returning to the cycle of reincarnation. Oftentimes the lower the social rank of the person who died violently, or who was treated harshly during life, the more powerful as a yūrei they would return. This is illustrated in the fate of Oiwa in the story Yotsuya Kaidan, or the servant Okiku in Bancho Sarayashiki. We are back to our full swing of learning! got to see how our students were learning. After this summer festival, two new students joined us. We also had our second Hiyoko Club in this semester. This is where the younger kids to enjoy language and cultural learning through songs, story telling, crafts etc with their parents and Manabiya students. The theme was mini Sports Day and they had fun with some traditional activities. Next Hiyoko Club will be on November 10th with the theme "Shichi-go-san." This is a celebration for seven, five and three year old kids for wishing their healthy growth. There will be a story telling, singing some songs, crafts and more! We are back in class! After the long, long summer break, our second semester has started on August 18th. Students brought their homework and they all looked great! Reviewing the journals/diaries everyone was assigned this summer along with homework, it was nice to read what everyone did during their breaks. In addition, the Manabiya students did a "Show and Tell" about their break time. We had a couple of guests from Yamanashi. When the students from the University of Yamanashi came, they did a small presentation about Origami.. Also, they helped us in the class by conversing in Japanese with advanced students, playing with them at recess, and making a poster and signs for our summer festival. It was a great opportunity for both of us to learn and have fun! Let's have fun with outdoor activities before the cold weather gets here! Did you know there are shoes named “Furoshiki”? Apparently, “Furoshiki”, the wrapping sole shoes were introduced on June 20th, 2018 by the company Vibram and was awarded with the ADI (Italian Design Association) Golden Compass?! Well… Ok, it’s just the stylist name for these shoes, but I guess I can see why they named these shoes “Furoshiki” because it literally wraps around your feet like “Furoshiki”. Furoshiki (風呂敷) are a type of traditional Japanese wrapping cloths traditionally used to transport clothes, gifts, or other goods. The name, Furoshiki means “bath spread”, derives from the Edo period (1603 – 1868) practice of using them to bundle clothes while at the public baths to prevent a mix-up of the bathers’ clothes. Later on, the Furoshiki usage extended to serve as a means for merchants to transport their wares or to protect and decorate a gift, etc. There are many sizes, from hand sized to larger than bed-sheets size and can be made of a variety of cloths, including silk, chirimen, cotton, rayon, and nylon. When plastic bags began being used in Japan, Furoshiki use declined. Furoshiki are still used in Japan to wrap a bento box or to wrap gifts. This art of Furoshiki wrapping is coming back again as environmental awareness increases and many modern furoshiki are designed with contemporary fabrics seeking to appeal to younger generations. Why not try giving Furoshiki usage a try for the next gift you wrap and include instructions on how to reuse/retie the Furoshiki? The added Furoshiki will complement the gift, and add a personal touch the receiver can pass on or use again and again. It’s already August; peak school summer vacation time in Japan, some of you may be able to meet Japanese tourists, and possibly receive a gift with a traditional Japanese art cord wrapped with that gift. What is a traditional Japanese art cord? It's called Mizuhiki, a specially designed cord derived from Washi (a traditional Japanese paper). 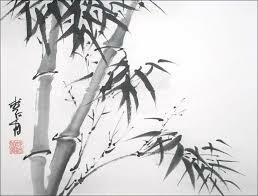 Washi is made from the inner bark of the kozo, gampi, and mitsumata bushes. The fibers of the inner bark of these bushes are much longer than in barks from other tree and bushes allowing it to mesh together easily. Washi is one of the most durable and strongest papers in the world. In Japan, there has long been a custom of showing thanks or respect by wrapping gifts in paper, attaching a noshi (a type of white paper representing a dried abalone), and tying it with a colored paper cord, Mizuhiki. Mizuhiki is often tied into a knot around gifts; with each knot having a particular meaning and each of these knots is tailored for a specific event such as a wedding ceremony or birth. The word “Mizuhiki” (literally “Water-pull”) is said to come from soaking materials such as hemp in water and then pulling off layers to make cords. In the Edo period (1603 – 1868), samurai and other townspeople used Mizuhiki for tying their hair in a topknot. A more modern use for Mizuhiki is using it to create jewelry and accessories, and it can be used to elaborately decorate a woman’s hair for special ceremonies, such as her wedding. In more recent times, Mizuhiki has been adopted by artists who creatively use it to create original 3-dimensional works of art. This event returns to Des Moines, Iowa at the Iowa Event Center from July 13 - July 15. Soten Taiko will be doing a Taiko performance on July 13. The following day, you can attended the following panel hosted by Tanis Sotelo, co-founder of Soten Taiko at the Family Programming Panel. Join JASI for a Bon Odori (Japanese Folk Dance) workshop at Thursday, August 23 at 6pm. The workshop is free and open to anyone who want to learn popular Japanese folk dances that are danced in Bon Festivals in Japan and the United States. Okonomiyaki at CelebrAsian was a great hit and received so much good feedback, so I’d like to share little more about this yummy dish with you this month. What is Okonomiyaki? (お好み焼き)…. It's a traditional Japanese food that is often explained as "Japanese Pancake" or "Japanese Pizza". It's a savory dish that is a bit more like an omelet or frittata than a pancake and it's made with okonomiyaki dough, eggs, cabbage, pork (bacon), shrimp or other seafood, and topped with a variety of condiments like sweet sauce (Okonomi Sauce), mayonnaise, dried seaweed and dried fish flakes. If you haven’t tried it yet, I highly recommend you to try one; it’s an incredibly delicious dish, crispy on the outside and soft inside. History – “Yaki” means grilled or cooked & “Okonomi” means “what you want” or “what you like” meaning that there is no “one” way to make Okonomyaki and no “one” recipe that defines it. Okonomiyaki was invented in Japan prior to World War II and evolved and became popular during and after the war. The earliest origins of a basic crepe-like pancake date back to the Edo period (1683-1868) where these were a special desert served at Buddhist ceremonies called Funoyaki. This then evolved during the Meiji period (1868-1912) into a sweeter dish called Sukesoyaki. During the 20's and 30's the dish continued to evolve with more emphasis put on the sauces added and the name Yoshokuyaki began to be used. The name Okonomiyaki started in the late 30's in Osaka. In Hiroshima at this time a similar crepe-like food was popular - it was topped with onions, folded over, and served to children as a snack item. Okonomiyaki, in it's different variations, started to become more popular during the war when rice became scarce and residents had to be creative in using other more readily available ingredients. The simple wheat pancake fit the bill and during and after the war, people started to add more ingredients such as eggs, pork, and cabbage. A restaurant from Osaka claims to have been the first to add Mayonnaise in 1946. There are two significantly different types of Okonomiyaki. First, the Kansai or Osaka style, in which the ingredients are all mixed into a batter and then grilled. Second, the Hiroshima style, in which a small crepe-like pancake is grilled and then other ingredients are layered on top. Whichever the style you use, the most important parts of Okonomiyaki is in mixed flour and sauce. The mixed flour contains wheat flour and dried, ground Yamaimo powder in it as an added starch for additional binding power, and flavor. Some already mixed flour contains powdered bonito as well. We succeeded with our dance performance at CelebrAsian! Regardless of the hot and humid weather, the kids did a wonderful job on the stage as well as being the hosts of the culture tent. The last day of our first semester is June 2nd and we will resume on August 18th. Our annual summer festival will be on September 1st this year. Our new academic year started on April 7th with a new student. We celebrated the day with fun activities and potluck with the students and their families. Now we are busy getting ready for CelebrAsian. Manabiya is in charge of JASI's cultural tent and the tent will be full of activities and decorations that our students creation. We will be also performing "Sakura Yosakoi" on the main stage at 2:00 p.m. It is a collaboration with Taiko and we will be in costumes and dancing with handheld instruments. For Hiyoko Club this month, we will celebrate "Kodomonohi" the children's day.